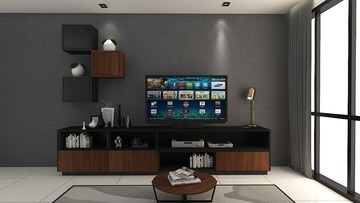 This stylish TV console provides plenty of display space in melamine finish. *There would be an additional charge of RM120 for lighting per side. 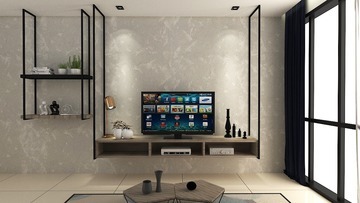 LINEAR is a stylish TV console which provides plenty of display space in melamine finish. Note: Pricing shown is only for the built-in carpentry work. Decorations, painting, loose furniture and wiring work are not included. Visuals are the designer’s impression only. Actual product may vary. *There would be an additional charge of RM120 for lighting per side. 1. I would like to order a TV console - how does it work? We will provide measurement and installation free of charge when you order a tv console from us. 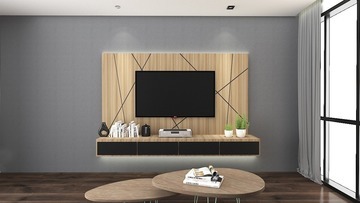 However, if you require customisation to the measurements or materials, or require creating 3D drawings, we will collect a 10% deposit upfront which is fully offset from the cost of the tv console. 3. 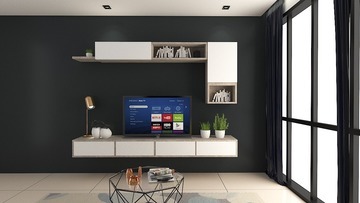 How do I make payment for my tv console? 4. Do the tv consoles come with a warranty? All our tv consoles come with a 3-year structural warranty (e.g. manufacturing defects, product failure), but this does not include wear and tear (e.g. water damage, stains from chemicals, scratches or dents from impact). We also provide automatic insurance against property damages, theft and up to RM100,000 public liability insurance for the duration of the installation. 7. What materials are your tv consoles made of? 10. I have an existing tv console but I would like to dismantle it - can you help? 13. How do I take care of my tv console such that it lasts a long time?